John 19:28 oAfter this, aware that everything was now finished, in order that the scripture might be fulfilled,* Jesus said, “I thirst.”p 29 There was a vessel filled with common wine. * So they put a sponge soaked in wine on a sprig of hyssop and put it up to his mouth. The Painting: (1) The end of Jesus’ ministry was marked by thirst – “I thirst.” But the beginning of it was also marked by thirst. Our painting presents for our contemplation a Samaritan woman who comes thirsty to Jacob’s well and finds Jesus thirsty (John 4:4-7). They meet that day because both of them “thirst” (4:6-7). Neither of them ever end up drinking water. (2) When a person is parched with thirst, all that he or she can think about is slaking it. One is not much interested, therefore, in being drawn into a theological conversation about wells or sacred mountains or, even worse, about mystical water! One wants a drink. Notice the irritation on the woman’s face in this painting. Jesus is compelling enough to get her to turn her head to look at him and to listen to what He is saying, but her body is strongly tilted toward the opening of the well, and her well-muscled arm is on the rope that will get her body what it wants. (3) The darkness of the painting – the lack of light painted into it – makes demands on our eyes, compelling us to strain to see what is difficult to see in the painting. This is a physical analogy to what thirst is. If you will, Rembrandt and his Protégé make our eyes “thirst” for more light. And that “thirst” remains even when finally we can make out what is there to see. Before the verb to thirst got associated with a person’s felt need for water when lacking it, it meant something else. Our verb “to thirst” appears in its earliest form in Old English (OE), or Anglo-Saxon (mid-5th century to 1066 CE), which is the earliest form of our English language. One of the first appearances of this verb we find in the Lindisfarne Gospels (c. 715-720 CE), produced by the monks at the Monastery of Lindisfarne in Anglo-Saxon Northumbria. In that magnificent illuminated manuscript, the OE verb “to thirst” translates John 19:28c (the Greek Διψῶ) – this fifth of the seven Last Words of Jesus. Real thirst is craving; it is strong desire. Jesus said, “I thirst.” We should pay attention to the strong desire of the Son. When a person is thirsty, significantly so, he or she can think of nothing else but water, and the deeper he or she goes into this deprivation, he or she can desire nothing else but water. Everything in him or her focuses through this singular attachment to the one thing necessary: water. And so we could say that the lack of water is the powerful presence of water giving itself to a person under the form of desire for it. But when a person is possessed by a desire for one thing, he or she has a strength that a satisfaction of that desire diminishes. Really wanting something brings to a person strength and alertness, fierceness and resourcefulness. When it comes to the health, strength of us, and concerns our focus as persons, we may rightly wonder whether we are better served by our lacks than by our satisfactions. Only if we have allowed ourselves to fall for the narrative of fallen humanity concerning the passion and crucifixion of Jesus can we say that He died because He had reached the end of His physical capacity to endure. Exodus 3:2 There the angel of the Lord appeared to him as fire flaming out of a bush.a When he looked, although the bush was on fire, it was not being consumed. The Crucifixion was about what LOVE was doing there at Golgotha, and only in a small and very ugly way about what we did to His physical existence, content as we were to extinguish that. Only this insight can make sense of Jesus’ last utterance: “It is accomplished” (John 19:30 – Ἰησοῦς εἶπεν, Τετέλεσται,). Three years earlier, soon after Jesus had begun His public ministry, THIRST was the host that invited Him and a woman of Samaria to meet one day by Jacob’s well. It was the thirsting of both of them that made this meeting happen. Jesus said to the woman, “Give me a drink,” though He could well have said, “I thirst.” And as things unfolded in that remarkable conversation (John 4:4-42), we notice that the woman never got around to lowering her water jug into the well of Jacob, giving then to this Stranger what He had asked of her. Neither of them drank any water! Instead, Jesus taught her about the other thirst. No one had ever taught her about that thirst, which had propelled her complicated life through marriage to five husbands and now into another relationship (John 4:18). She did not understand what only this Stranger could teach her about that other thirst: “to have a longing, a craving, a strong desire” and to know what that meant, and how properly to handle its force in her. 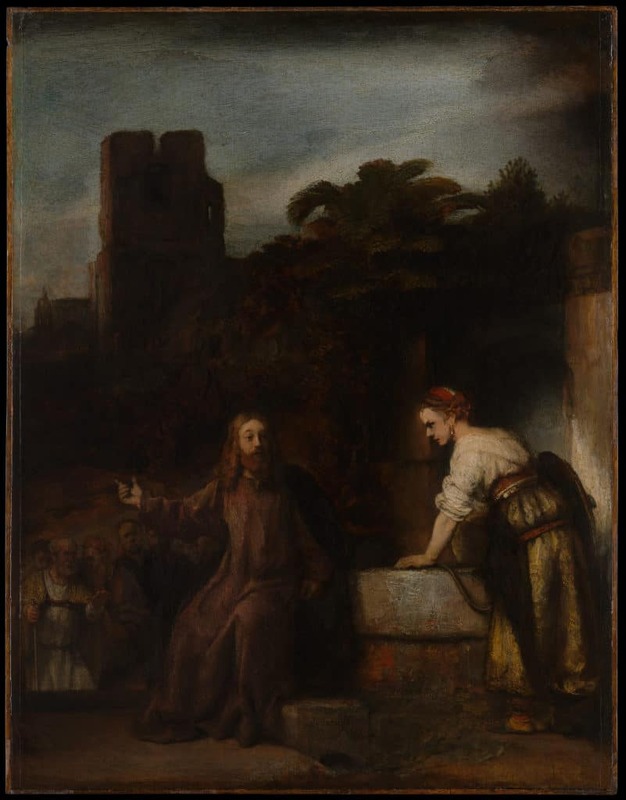 Jesus said, “I thirst.” And as was the case with that Samaritan woman, so it remains the case with our Lord, resurrected and sitting at the right hand of the Father: the thirst remains, that other thirst, and it always will. ﻿Another morning and I wake with thirst for the goodness I do not have. I walk out to the pond and all the way God has given us such beautiful lessons. Oh Lord, I was never a quick scholar but sulked and hunched over my books past the hour and the bell; grant me, in your mercy, a little more time. Love for the earth and love for you are having such a long conversation in my heart. Who knows what will finally happen or where I will be sent, yet already I have given a great many things away, expecting to be told to pack nothing, except the prayers which, with this thirst, I am slowly learning. Doers of the Word: This fifth week of Lent – the week just prior to Passion Week/Holy Week – gives us each an opportunity to distinguish between, on the one hand, a thirst that restlessly, ceaselessly we are driven to satisfy in so many things that fail to satisfy us, to make us happy, and to bring us genuine peace, and, on the other hand, a thirst that we cannot satisfy by anything that the world offers to us – that other thirst, a thirst that remains even in the unconquerable heart of the divine Son in glory. This week let us unfasten ourselves each day from an easily satisfiable desire (a desire for a meal, a desire for a convenience, a desire for a pleasure, a desire for a friend rather than for the person God puts in front of us to bless, etc. ), so that we can grow in our ability to distinguish between a thirst that we can quench and a thirst that we can never quench. The Metropolitan Museum of Art is the holder of this painting. They remark about it: “The authorship of this painting has been much debated, but most scholars consider it to be by a Rembrandt pupil of the mid-1650s, with improvements made by the master himself. The 1656 inventory of Rembrandt’s possessions lists ‘a painting of a Samaritan retouched by Rembrandt.’ He often assigned biblical subjects to his students as exercises in stagecraft as well as painting or drawing techniques.” See: https://www.metmuseum.org/art/collection/search/437403. For this reason, they give as the Painter: “Style of Rembrandt” rather than of, or by, Rembrandt. o Mt 27:45–56; Mk 15:33–41; Lk 23:44–49. * The scripture … fulfilled: either in the scene of Jn 19:25–27, or in the I thirst of Jn 19:28. If the latter, Ps 22:16; 69:22 deserve consideration. * Wine: John does not mention the drugged wine, a narcotic that Jesus refused as the crucifixion began (Mk 15:23), but only this final gesture of kindness at the end (Mk 15:36). Hyssop, a small plant, is scarcely suitable for carrying a sponge (Mark mentions a reed) and may be a symbolic reference to the hyssop used to daub the blood of the paschal lamb on the doorpost of the Hebrews (Ex 12:22). New American Bible, Revised Edition. (Washington, DC: The United States Conference of Catholic Bishops, 2011), Jn 19:28–29. This linguistic history is from the entry at “thirst” (verb) in the Oxford English Dictionary. This same double meaning of “to thirst” is attested in Classical Greek, and therefore in New Testament (Koine) Greek also. * Baptism: i.e., his death. Notice here how, again, it is water – the lack of it – that Jesus’ desire focuses upon. One must have water for there to be a baptism. New American Bible, Revised Edition. (Washington, DC: The United States Conference of Catholic Bishops, 2011), Lk 12:49–50. A section from the poem “Fasting” by Jelaluddin Rumi (1207-1273 CE), found at July 26 in A Year with Rumi, poems selected and translated by Coleman Barks, page 236.
a 2:4; 7:30; 8:20; Mt 26:17, 45; Mk 14:12, 41; Lk 22:7. New American Bible, Revised Edition. (Washington, DC: The United States Conference of Catholic Bishops, 2011), Jn 13:1. New American Bible, Revised Edition. (Washington, DC: The United States Conference of Catholic Bishops, 2011), Ex 3:2. Barbara Aland et al., eds., The Greek New Testament, Fifth Revised Edition. (Stuttgart, Germany: Deutsche Bibelgesellschaft, 2014), Jn 19:30.
c 1:17; Wis 14:7; 15:3; 1 Jn 5:20. The Greek is τὸ ἔργον τελειώσας. d 1:1, 2; 12:28; Phil 2:6, 9–11. New American Bible, Revised Edition. (Washington, DC: The United States Conference of Catholic Bishops, 2011), Jn 17:1–5. Mary Oliver, Devotions: the Selected Poems of Mary Oliver (Penguin Press, 2017), “Thirst,” page 141.